This personalized gift is a classic kids love! A pink or blue personalized kids piggy bank is made of genuine ceramic, with felt on each foot to protect table or dresser tops. No need to break open this personalized piggy bank for kids - it features a rubber stopper underneath. We'll personalize. Specify name; limit 1 line, 12 letters/spaces for each personalized ceramic piggy bank. 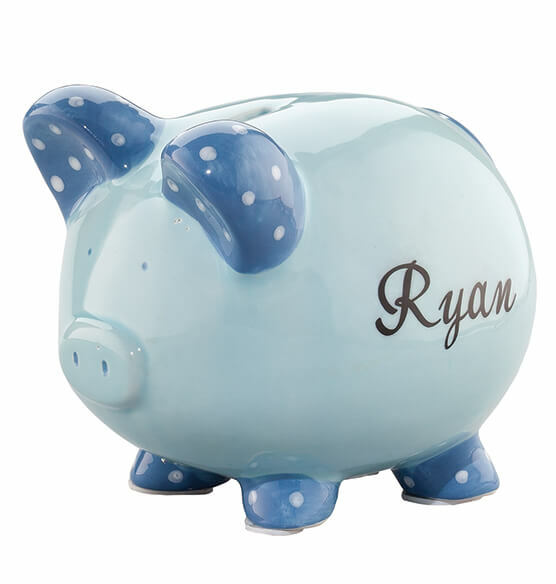 Our personalized piggy bank measures 6 1/2 " long x 5 1/2" wide x 6" high. I ordered 3 piggy banks for Christmas gifts like the way they looked and size so I ordered 3 more for birthday gift later I the year. It is perfect for newborn gifts. I bought one for each of my grandsons. We have bought three of these piggy banks for our great granddaughters with their names on the side, all in pink, of course. We will put some change in each one, and think it is a great way to encourage saving. The piggy banks are cute, the names fairly large. We think they are a good value. I bought 3 of these for the little kids in my life, and I know they will love the fact that their name is on it and it will hold lots of change!! My daughter loved that the piggy bank has her name on it. She loves it. I purchased these for babies. I thought it was a great gift to give a newborn. It is adorable and the fact that their name is on it made it more special. The design is cute and it is affordable. I plan on buying one for all the new babies in my family. It is something they can keep forever. I looked in all the stores for an affordable, blue, personlized piggy bank and the prices were outragous. And none of them was blue. I googled piggy bank and yours was there. Exactly what I wanted at an affordable price. Piggy Banks were a gift. Arrived in perfect condition. I purchased this for my great niece. She has a unique name so this was great that I could have her name personalized on it. I had also purchased one for her brother two years ago. They are just adorable. The kids love them. We are giving these piggy banks to all of our grandchildren with money inside to buy something they want for Christmas as a Christmas gift...also saves us the trouble of trying to buy the right size clothing, right game, etc. Perfect Christmas gift!!! My granddaughter will love it! I bought two in blue,when my grandsons were born. I have used these banks as baby gifts for several friends of mine. Once the child's name has been chosen, I hurry to order one of them (in the appropriate pink or blue) and have the name put onto it. They are ALWAYS well received! To start the newborn off with good luck, put a few coins into it before gifting and get them started. Got this as a gift for my niece. Looks absolutely adorable. I had it personalized with her name. Looks so well done. I couldn't be happier. I already bought 3 of these for gifts. I just love them! I wouldn't buy any other piggy bank but this one. It's made very well, with the good rubber piece on the bottom to hold in the coins. It's the perfect size. They always do a great job writing the personalized name on it too. only thing this piggy bank is missing is money. This article was a gift for my great great niece . She is 25 mos. and will hopefully begin to learn how to save money. Bought 3 of these last year as Christmas gifts for our grandkids and was completely and totally satisfied and amazed at how wonderful these were. Bought 3 more this year for new grandkids and can't wait to give them to them. The pink and blue with the contrasting color on ears, tail and feet are great and the personalization makes them unique. Definitely worth more than the price. Great to start college fund at an early age. This is a great piggy bank and the personalization came out great for our grandson! I would definately buy one of these again. I love these piggy banks! I love this bank! I have purchased one for each of my grandchildren and they love it! A good way to teach kids how to save some money and not spend it all at one time! Item given to a 2 year old as gift. Must be handled with care till child gets older. This gift is a tradition. Gave the personalized banks as an Easter present and the grandkids loved them. Have given this for gifts and the personalized touch is always a hit! This was a gift for my Godson. His mother loved it. I loved it. It was great. Plus it didn't take long to get the product as well. Order from here! I will buy this product again!!!!!! Wanted to start our new baby grandchild on the way to saving! Parents loved it! I bought this for my son for his first Christmas and he's 2 1/2. It broke today, on accident. My son broke in tears because he always puts coins and money into it. It is his favorite and he loves to save money. I just had to replace it and get a new one. The price is great and it made a perfect gift. This is such a great baby gift. And I love the fact that it can be personalized. This is a wonderful aspect when a new baby has a unique name. My granddaughter was named after her great-great grandmother. But the name is so unique you cannot find items already personalized with her name. This was the perfect gift. Great gift- Loved it! Perfect for my niece. Design was great, quality was great. Fair Pricing, [...] Lovely Product. A big hit with the grandkids. I got 2 of these for my grandchildren to replace their cheaply made plastic ones that kept coming apart. I found these to be good value...compared to many on line at $25 and up. The personalization is nice, and best of all, the kids love them. I ordered these for my great-grandchildren, I am still waiting on one to be delivered, but the one that came is so cute! And They are quality porcelain. Teach your kids early to save money!! I use the products from Miles Kimball catalogs everywhere in my home. They have products for everything you can imagine. Ordering is soo simple and its delivered to wherever you want it to go. Miles Kimball makes my life mush simpler. The banks makes a great gift. The personalization looks really good. This was a gift for a new baby. My children still have their glass piggy banks from 40 yers ago and display it proudly. I hope Izzy (Isabella) will do the same. Perfect keepsake gift for the grandkids! I ordered one to see how it looked and loved it. Ordered more for all the grandkids! The first person I bought it for loved it. Ordered it again for a baby shower on Sunday afraid it's not going to be here in time. This piggy bank is adorable. And add to that it is personalized. A great gift. Perfect for a gift! Love it...will buy more! 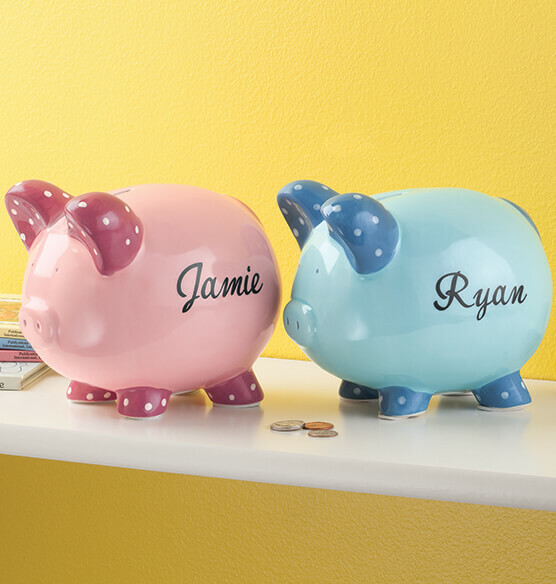 Super cute personalized piggy bank! I bought this as a gift for my niece. It is much larger than I expected. The personalization is nicely done and the overall quality is very good. Your products are very nice but your shipping takes way to long!!! Perfect gift for toddler, my son really like it. A gift for my new granddaughter. I gave these as gifts to my second cousins and they are just perfect for them to start saving their change in. I love that they are personalized and so cute. TY for offering them for sale at christmas time. THEY WERE GIFTS AND I WAS VERY PROUD TO GIVE THEM. I bought one of these for my niece a few years ago and one for my nephew recently. The pink one has survived two military moves and is still in great shape. I'm sure this blue one will do the same. This is the 2nd one I've bought for a grandchild; I'm sure it will be kept for a lifetime. Great Christmas gifts. Sent directly. No hassle. This is the best baby/shower gift ever! I add $1.00 in change inside the bank for good luck. Great way to start saving. Bought one for each of my grandkids and put them in my china cabinet. Everytime they are over we put some money in their piggy bank. They all love having their names on them and know exactly which one belongs to them. LOVE. . LOVE . .LOVED IT! My son has always wanted a REAL piggy bank. We got this as his gift for his 6th birthday this year and it's all personalized. I LOVED IT and so does he! It was a big hit at the party! I will shop here AGAIN! Ordered two of these piggy bank. Very nice, cute. One for a boy one for a girl. Would recommend. This is a piggy bank with the childs name on it and it is so pretty. I got a blue one for my friends son and pink for her new baby girl. She just thought it was so special and will keep them forever. This is the second personalized piggy bank I've gotten from Miles Kimball for my second grandson. It is just adorable and the first grandson's still stands on his dresser (he's 4 now). A little heavy for a 3 year old, but he likes it a lot! My boys love having their names on their piggy bank! just adorable and nicely done. I bought a blue and a pink, for my next two grandchildren. I liked the first one, bought 3 years ago, for the first grandchild. The piggy banks look great on a shelf, and the money can be "heard" when dropped into the bank...significant for little children! Purchased this bank for my daughter's baby shower. Had it personalized "Baby" last name. Used it as a way to begin a savings for baby by having guests donate while offering advice to the new mom. Guests loved it! It was a great hit and will be a nice keepsake. Cute bank, and large enough to really be used for a while. Would have liked the name on each side and a little smaller. However, the script was beautiful! Loved it. Great gift for kids of all ages!! I bought this for 3 of my nieces and nephews for Christmas. They range in age from 1 to 4 and I think they will all enjoy it and use it for many years to come. There was a little chip off of it but it was still enjoyed by the mother and father to be. I bought 2 banks one pink one blue for my grandchildren. I was very pleased. Their names imprinted on them was nice and bright and just right in size. And for the price, it was great. I searched and searched the Internet for a personalized, cute, not-too-big first piggy bank for my daughter. Oh, and I wasn't willing to pay [$] or more for it. I was super happy to find this sweet piggy bank that was very affordable. I am happy with the quality and it looks great on her dresser! This piggy bank was so cute. A little pricey for it's small size but well made. It was a gift for my neice and she loved it. I bought matching personalized piggy banks for our granddaughters - they were born only 6 mos. apart. These will stay and Grandma and Pop house and money will be placed in them that have the year they were born - 2009 & 2010. When we have them full, they can take them to their house! I got one for my first grandchild so when my twin grandsons were born I had to get them one also. Wasn't here for xmas as promised. This is false advertising. The font is extremely small. My previous 12 orders the font was big & beautiful. The customer service did not help me at all to replace it. The slot is too small and will not accept half-dollar coins. Qualtiy Control is not a priority for Mileskimball. Sadly, my [$] piggy bank for my infant son turned out to be a big disappointment on many levels.First off, the name looked to have been smeared half off?? You could barely make out what it said.Second, the bottom of the feet all had a small, soft, rubbery/foam adhesive padding stuck to them to ensure no scratching on the dresser surface. However, my piggy only had 3 of the 4 feet covered? ?And finally, we decided to send the piggy bank back as this was clearly not what we wanted [...] Really guys??!! !Certainly the last time we'll ever order from them!!! Received 2 as gifts - included first and middle name, disappointed and looks cheap and names take over entire side of bank! Also writing looks like it was done with a large black majic marker! I see they offer an etched engraved bank - I'd prefer that one. Too bad personlized items can not be retunred according to the packing slip. I'll put them in the closet. It would be nice if this piggy bank had eyes. Very boring even with the name on it. I bought two banks for my children. The banks are nice but if you are handling the banks too much the letters on the bank rub off. I thought the letters were written with paint but there not. They rub right off! I was very dissapointed. Great way to teach young child about savings. I sent blue to a 6 year old child. His grandma began with inserting some quarters.